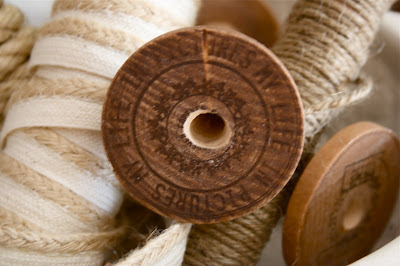 Yesterday, I shared with you here that I have a love for vintage spools. I found a bunch while antiquing, but the prices were ridiculous, so why not just make my own? I bought a 3 foot dowel rod and some little wood disc thingies in the wood section of Hobby Lobby. Then, I cut the rod with a miter saw every five inches or so. Next, I stained all the pieces with some Antique Walnut Minwax Polyshades (stain and poly in one). I didn’t bother nailing these together and simply used Gorilla Glue to make the spools. I allowed the glue to set overnight and then this morning came the fun part! Using the largest drill bit I could find in our basement I drilled holes through the rods. To finish off the look, I used some stamps from the craft closet, a marker, and various bits of twine, rope, and ribbon. Ta da! Vintage spools for around $6! I am thrilled with how they turned out. Once my craft room is ready, I will put these to use holding some of my favorite ribbon. For now, they just look adorable in my vignette. The spools aren’t the only thing that received a makeover today! These ugly framed pics were formerly on top of my kitchen cabinets and begging to be spray painted. A coat of Heirloom White, picture flipped around (I didn’t even use chalkboard paint), and a chalk marker later and we’re looking pretty cute, eh? That green bowl that you see below also got attacked with the Heirloom White! Here it is now with some antique staining to boot. Ah, much better! My drill slipped and gauged the wood making it look all the more vintage! Yay for mistakes! 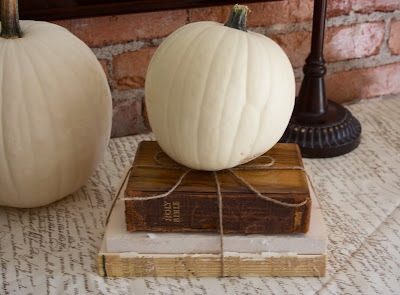 I ripped the covers off of two old books and placed an old Bible on top tied with twine. It’s the perfect perch for my market fresh pumpkin! The old scale was a recent Craigslist find. I’ve had my eye on them for a year now and was waiting for a cheap one to come my way. Hoorah when it finally did! I love the rusty patina on this one. And just in case you were wanting a bit more perspective on the dining room…. I have a couple of vintage ones that I use for candlesticks. Love them! Hope I can find this disc thingies uphere. Thanks for sharing, so inspired! LOVE LOVE LOVE the spools! And sharing! So this is funny…sometimes I like to just start following random links from one blog to another and see where I end up. Somehow I wound up on Nester’s fall mantel party from last fall, and from there, I wound up here! lol…I love the blogosphere. And I love, love, LOVE these spools! I think I’ve seen you mention your DIY vintage spools in a recent post or two, but I missed how you had made them. What a great idea! And I’m sure you saved a bundle. 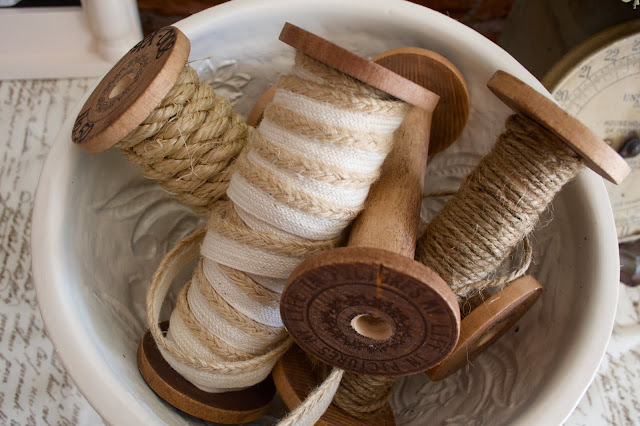 I love the spools and using jute and twine on them. Very cute! I'm definitely going to have to try that. I love those vintage spools!!! SO creative!!! Cute cute cute! Your dining room is so pretty! What a great idea!! I used to have a bunch of spools back in duck country decorating day and sold them when I was updating my style. I have been wanting more to store my laces and ribbons in my one day gorgeous craft room but too pricey!! Here is the perfect solution!! So creative! Thanks for linking up the The DIY Project Party! I LOVE everything. I want an old scale and an old fan too. It is super hard to find that kind of stuff down here in Florida. It seems that everyone gets rid of everything before they move here. Thanks for linking up. We look forward to seeing more and more pf your projects. Those spools are so cool and I love the vignette. Yummy scale, too. 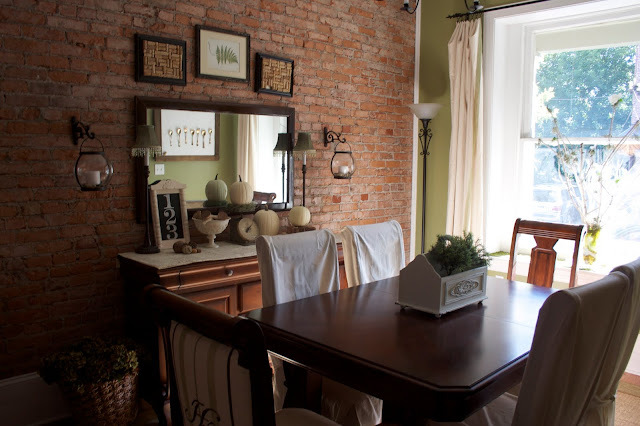 I love the way you did your dinning room wall!!! I love teh wine bottle korks 'framed up!' Are they cut in half???? I am new to your blog! So cute – you've got some great stamps and I love how they look on the ends. Fabulous job Beth! omg, I love the spools! I've been dying to get my hands on some and your idea is amazing! I remember longing for spools in my University days…and then finally purchasing a few years later. Thanks for sharing this tutorial…I can now add to my very small collection! The spools made me cry a little bit. I wouldn't have ever guessed these were handmade if you hadn't told us! Um…wow! Those spools look amazing! The whole vignette is beautiful. I love all the changes you made and can I say it again?… The spools look so good! Just found your blog through CSI…love it! Your spools are brilliant…they look authentic. Happy fall! I love those spools and I obviously don't have the right kind of stamps in my stamp collection. These are too cute! 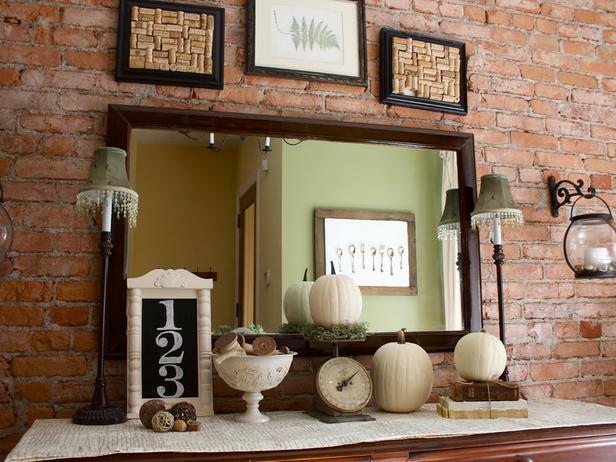 I love the picture frames and the painted bowl. Awesome! I'm brand spankin' new to your blog and I love it. I paged through it the other night and even showed my man some of your house renovation photos. 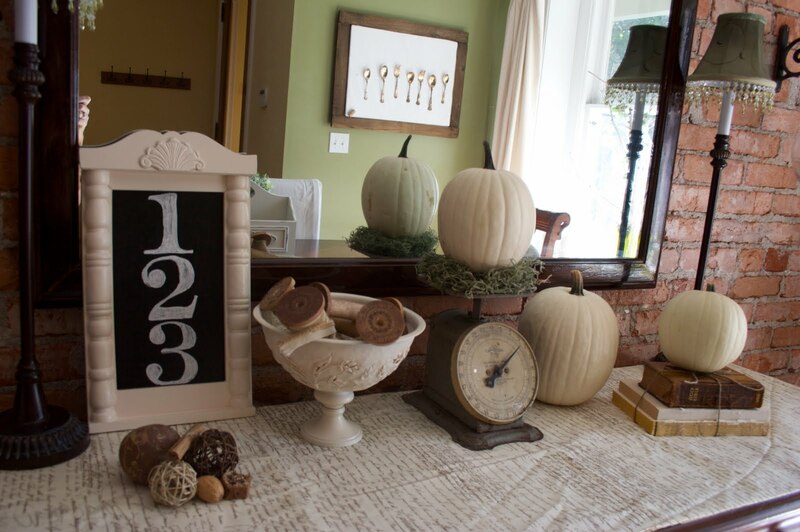 I see we share a love of white pumpkins and chalkboard paint! So happy to have found your precious acherage in the blogosphere! no way! those spools are amazing! how creative! they look soo authentically vintage! love it! Beth, I just sent you a DM about an extra ticket for the Nate Show. Let me know ASAP!! I'm the idiot cause I didn't leave my name! Duh. Silly me. As you know from my site it's Marisa Porter and I saw your husband's pic and I thought it was so wild and funny that I found your blog while trying to find sonia kashuk information. I was admiring your beautiful artistic images and then was like, "Hey I know this guy – it's Matt Hunter." Nice to see your lovely blog! I will probably check up on it again. I am lovin' those spools Beth!! The vignette looks amazing!! Those look authentic to me! Great job on the decorating. 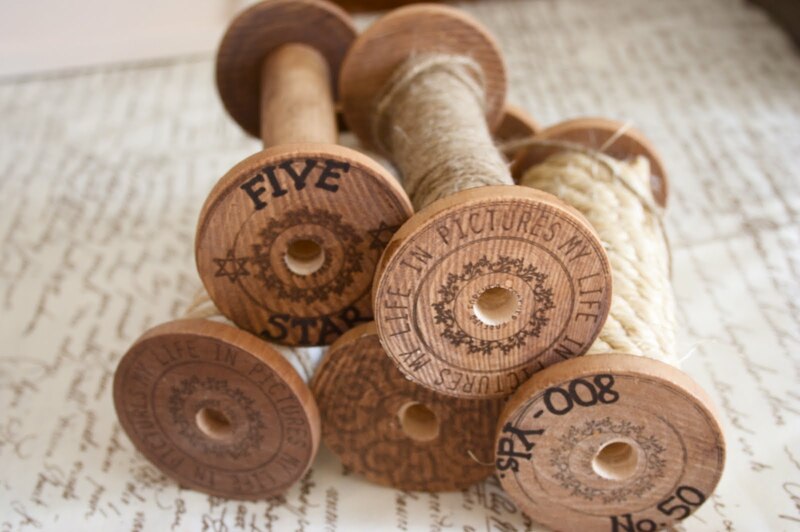 Your spools are amazing, love the stamping. nice decor layout. I am making some for myself! Ahh Beth! Those spools are amazing! I'm impressed, wow. They look so PERFECT. 🙂 I really love what you wrapped around them all too. Just beautiful. Beth, those spools look amazing! Truly vintage looking! Your creativity never ceases to amaze me. Those spools are amazing! The buffet looks very nice…great job as usual, Beth! Continued blessings. 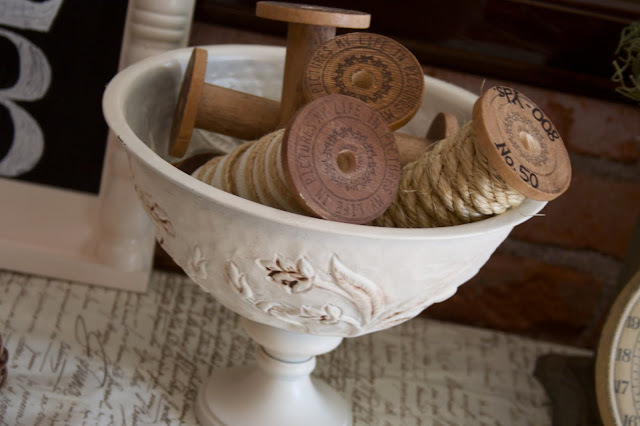 I love the whole vignette, Beth, but the spools came out fantastic! I actually think they look so good there you might want to make more just for your ribbon! Nice redo on the pictures and bowl; and I love the books, too. I love the spools and the scale and the white pumpkins and everything!! No way! You made those spools yourself? They look lovely. What an imaginative idea. Really well done!!! Those are so cool Beth! They really look old. I love the stamps that you used! That is wonderful. And your vignette is so pretty! Oh, I love, LOVE, love those spools you made! They are truly amazing! Wow! I also wanted to let you know that we are having a giveaway over at Beautiful Nest, if you would like to check it out! 🙂 Have a good night! Send me a handful of those fab spools, okay? Kay. Seriously- for those without the tools, we would totally buy faux spools. Just saying. these are just brillant! love the look & the vintage vibe. they are wonderful. is that a script table runner or paper??? it all looks so perfect together. gosh, when you get inspired you recreate! i love that about you. thanks so much for linking up with the FALL FESTIVAL! i am thrilled to have you. those spools are fantastic! they really look so vintage. love the vinette with white pumpkins…those are on my "to buy" list this fall. I am in love with these! They are really too stickin' cute! You are so stinking clever! That looks wonderful! wait, where is there a local hobby lobby? love your vignette, especially the pumpkin on the books! Oh my, my!!! I'm in love with your spools. They look so good. They look perfect in your fall vignette. Can you believe that I haven't done any fall decorating yet. I've been such a lazy blogger lately. Yikes, I need to get busy. Those simple changes made a big difference. Your "afters" are just gorgeous. Wonderful makeovers!! I did not think about painting glass bowls! Love how it turned out! Your dining room looks divine! wow!! very cool stuff…you are VERY creative! Geez girl! You are the QUEEN of thrifty vignettes that r.o.c.k. Totally pinching this for my inspiration files. Totally. Beautiful! Love how you made the spools! That is a great idea! 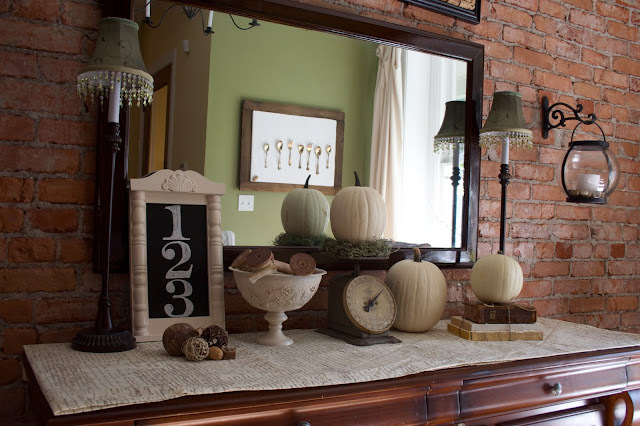 I love this vignette! It's so fall-ish and autumnal, without being so ORANGE and BROWN. It's unexpected– which makes it charming! What a great idea to make your own spools. I love the whole vignette. Very pretty! Great ideas!! I love, love, love the spools! And I can't believe you were able to spray paint that bowl!! That's an inspiration because I have several that are well, just ugly!! Wonderful post! I am insanely in love with these!!! Are you interested in making some to sell??? They are absolutely wonderful. If not, I'll have to make my own. These are the best ever!! So very Creative. 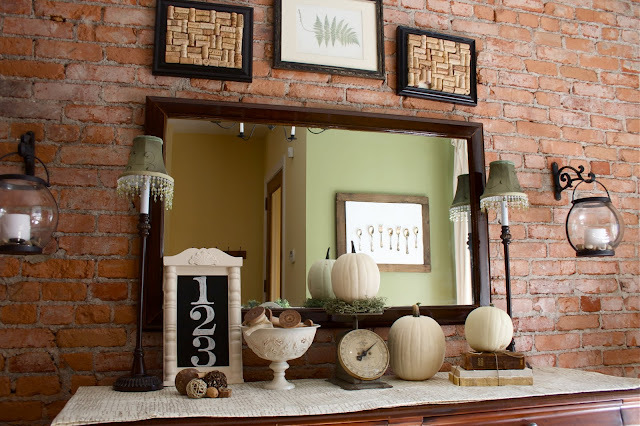 I love love love the spools…and the bowl and the "chalk" board frames! Thanks for posting!! I'm in love with those spools. I have to make some. 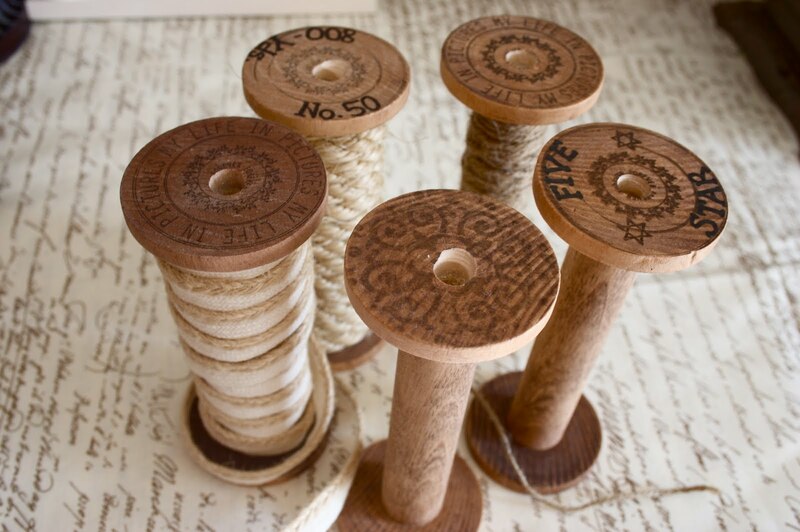 what a great idea to make your own vintage spools! they turned out really great!